Most readers do indeed judge a book at least in part by its cover, which is why major book publishers have whole departments and many, many meetings dedicated to their creation. The book jacket is a sales tool, inviting readers to the text, telling them much about what they will find on the pages between the covers. Despite the adage, the book jacket generally broadcasts to the consumer much about the book, ideally casting it in the best light possible to draw in its target readers. 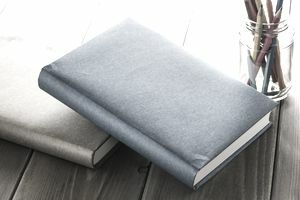 Whether it's in the mystery novel genre, a serious nonfiction tome, a romance or a cookbook, the reader should be able to ascertain book genre and the tone of the book from taking a quick gander at the front of the book jacket. Of course, the potential reader should also be able to clearly read the title of the book. In addition to what's typically on the front cover, the details of the plot, an idea of what some others think about the book, the biography of the author are additional pieces of information that can be found on the other parts of the book jacket—the back and the flaps—once the book is picked up off the shelf (or clicked on). In a traditional publishing house, the book jacket design process generally happens in tandem with much of the editorial and production processes of the book and starts months—even a year or more—in advance of publication. It is because the book jacket needs to be included in the book publisher's seasonal or specialty sales materials, such as catalogs (which are used by the sales representatives to sell the book into bookstores, gift stores, libraries, etc.) or BLADs or ARCs. It's obvious from the catalog when there hasn't been a resolution about the book jacket—the book's page will have a blank box with the book title or a large author portrait photo. In a traditional publisher, a designer on staff in the cover art department or a freelance designer who has been engaged for the purpose gets early access to any information or materials available on the book (manuscript, synopsis, etc.). From those materials and discussions with the book's editor, the designer develops concepts for the cover. Then, generally, the book's editor, the editorial director, and the publisher will weigh in on the different concepts and narrow the choices. Often, there's a weekly cover art meeting in which the art department presents jacket concepts and invites discussion about the dozens-to-hundreds of books that are being produced throughout the year. If you're an author being published by a traditional publishing house, don't count on having a lot of say on your book cover. Most editors want their authors to buy-in to their own book cover design so that you might be consulted at some point in the process. But this is typically a courtesy extended by a thoughtful and responsible editor. Unless you're a bestselling or high-profile author, your contract will not likely entitle you to cover approval, and the final say on the book jacket design will rest with the publisher or someone on the publishing or editorial staff. Once pretty much everyone is happy with the concept, the jacket is fully designed and released for purposes of promotion on online bookseller sites (like Amazon.com, which gets a feed of pre-publication book details), seasonal publisher catalogs, etc. It is not uncommon for a jacket to be changed after the designs are shown, or the book is announced in a catalog. When the book is being "sold in" to stores pre-publication, the bookstore buyers' opinions can do much to sway a publisher into changing a jacket. As buyers—especially buyers from major accounts, such as Barnes & Noble—are extremely well-versed in what their customers generally respond to, they may have a strong opinion about a jacket, especially if there are high sales expectations for the book. The buyer has a lot of clout, so it's not uncommon for a jacket to be modified because buyers reacted negatively to the original concept.